Ocean Avenue in Santa Monica seems to be poised to become the west coast version of Shore Drive in Miami. The once sleepy strip has plenty of art deco buildings blending in with high-rise towers, cafes, art galleries and notable new restaurants with ocean view dining – all bringing hoards of weekend foot traffic. We reported recently on sleek sushi spot Bamboo and the patio friendly Spanish revival private club Ocean 41 next door. Season’s 52 – one of our favorite restaurants for sourcing delicious meals under 500 calories, located in Century City and the OC, has also opened an outpost just down the block with private room options and a scenic view patio. The beach side venue has the same satisfying locally sourced menu and excellent global wine list. The bar area also features a piano player nightly which should draw the crowds this summer. Last year, Brent Bolthouse opened The Bungalow – the only rustic and cozy beach side outdoor bar venue where you can actually watch the sunset with a margarita in hand and order tacos from Ray Garcia’s FIG at the adjacent Fairmont, all while you shoot a game of pool. The affordable and sustainable Shore Hotel – adjacent to modern Mexican cuisine at Blue Plate Taco, both hit the strip in 2012, and Art Deco gem Shangri-La is still going strong with The Dining Room, poolside cabanas and rooftop bar and lounge, Suite 700. 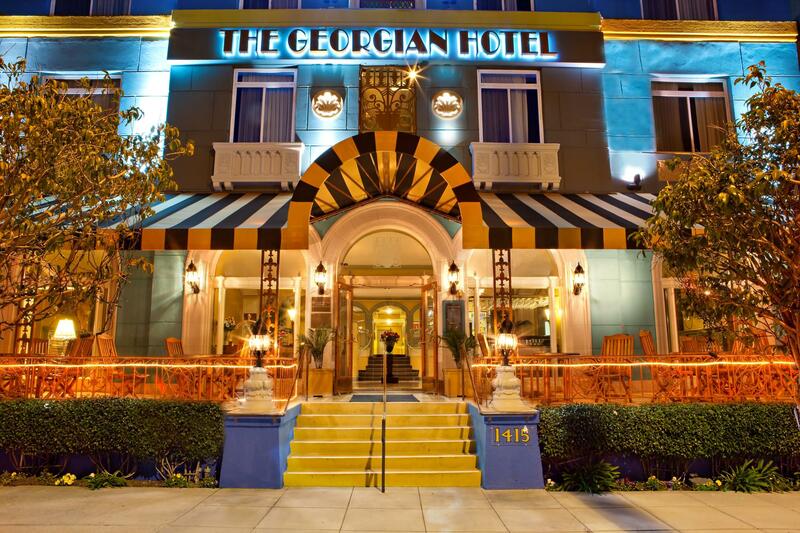 One of the most surprising updates has been the revamp of the boutique Georgian Hotel, established in 1933. During the Prohibition Era, the now turquoise and yellow art deco building’s basement held a speakeasy where Clarke Gable and Carole Lombard sipped gin. 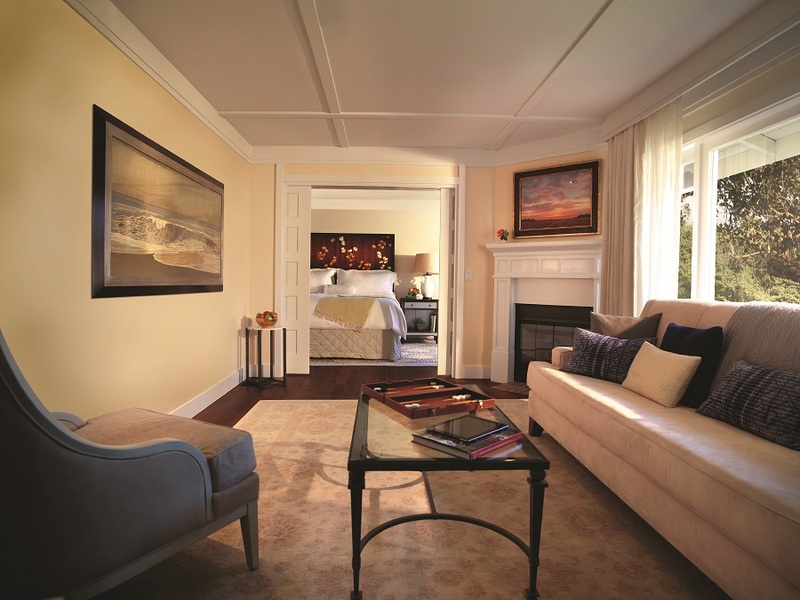 The suites are spacious with lounging sofas and panoramic views. This is probably one of the best price points you will find with direct access to the beach, the Promenade and the Pier starting at $220 per night. The Veranda restaurant serves breakfast lunch and dinner, with a happy hour from 5-7pm on one of the only true alfresco terraces located right along Ocean Avenue. Up until a few years ago, the common areas were only open to guests of the hotel, but they have wisely opened up the indoor and outdoor dining areas to the public. Try the famous French toast soufflé for your first meal of the day, the brie and mango Quesadilla or Mediterranean salad at lunch, then the salmon filet topped with cilantro lime sauce for dinner. While the Georgian is not a large property like the Shade Hotel or Shangri-La, the Oceania Beach Club Hotel is completely off the radar at the residential end of Ocean Avenue and Montana. Earlier this year, Michelin-Starred Chef Josiah Citrin of Melisse in Santa Monica, designed a new menu for the properties retro-chic Tower 8 restaurant and bar. 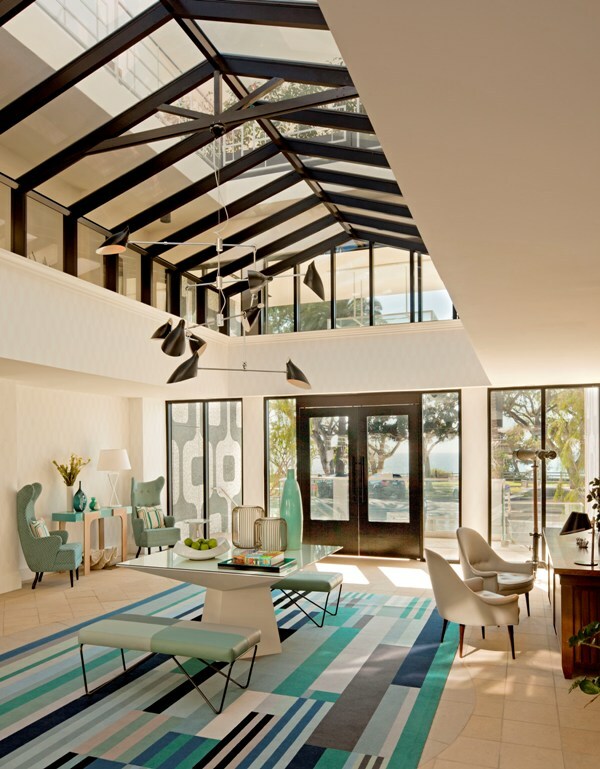 The scene is like something out of the Jetson’s or Mad Men with mid-century modern furnishings in shades of blue and green. The menu on one hand reflects a casual café environment but the offerings and service are fine dining material. A small plate must is the mini-lobster roll which is more like a sandwich pocket stuffed with the juicy crustacean meat from Maine– and its far better than any of the other versions served on the Westside. Entrees include a flaky wild King salmon with bok-choy and shitake mushrooms. For lunch, try a Paso prime grass-fed burger or Cuban braised pork shoulder sandwich with a side of Tuscan kale salad. Perched high above the hills in the ‘California Riviera’ aka Santa Barbara, the landmark El Encanto reopened it’s doors last month and the restaurant is fully open after a seven year closure. This grand reopening also marks the first West Coast property for the Orient-Express, who is primarily known for European trains and restoring historic villas around the world. El Encanto spans seven acres amid lush garden landscapes with an expansive ocean view and has been a hideaway in the hills for close to 100 years. While the footprint remains true to it’s original design, the property now boasts 92 individually designed California-style bungalows, with hardwood floors and plantation-style shutters that reveal wild growing Bougainvillea. Each bungalow has its own private patio or garden, where guests can choose to dine al fresco or enjoy a romantic sunset in complete seclusion or take in the ocean view via a terrace Telescope. The 800 square-feet Hummingbird Bungalow even features its own outdoor rainforest shower. World famous artist Damien Hirst’s ‘Psalm print: verba mea auribus’, which is prominently located at the concierge desk, was created on a silk screen with diamond dust. The abstract piece depicts butterfly wings, as the hotel is located on a significant butterfly migration path. The kitchen is now overseen by Executive Chef Patrice Martineau, who has created a ‘Californian Coastal’ menu, incorporating seasonal produce from the Santa Barbara region, as well as freshly picked herbs and vegetables from the hotel’s Chef’s Garden. Chef Martineau has recreated the ‘Floating Island’ dessert, which first made its debut on the menu in 1920. And, in a culinary twist indicative of the Orient-Express, the property has its very own Holstein cow, Ellie, whose milk will be solely used to produce handmade cheese for the guests. The spa consist of seven treatment rooms, including a couples room and wet room, with a selection of therapies infused with calming sea elements, such as seaweed from Patagonia, or vinotherapies, which offer healing properties extracted from regional vines. One of the spa’s signature treatments, The Pinto and Cabernet Crush Sugar Scrub, drains toxins and stimulates circulation through a refining and renewing body scrub that combines Pinot and Cabernet grape seeds, brown sugar, and Kaolin clay for an invigorating experience. Discover the surrounding area with a custom made electric bike. With a quaint basket at the front of the bikes, the hotel can prepare adventurous cyclists with a picnic for their journey down to the Santa Barbara town center, or to a secluded leafy spot where you can relax and take in the views. For further information please visit www.elencanto.com.